THQ Nordic today announced the development by the Germans Cliffhanger Productions of Jagged Alliance: Rage! a new episode of the prolific series of turn-based war strategy that has its origins in 1995. The new game will see us lead a team of three soldiers – each with different specializations – on a modern-day island controlled by a crime lord. We can control with turn-based mechanics the actions of all our soldiers, going from stealth tactics to direct attacks. Jagged Alliance: Rage! could be playable also in two-player online co-op, and will include a strong narrative component with interlude sequences and character dialogues. We hope it is finally the right Jagged Alliance. A first hands-on test by rock paper shotgun has left good feelings, moreover at this link, you’ll find a let’s play. 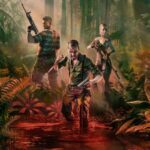 The release date for Jagged Alliance: Rage! is set for Fall 2018. Below you will find the announcement trailer and steam page.